FloodAdvisor® is a self-contained low cost flood water level monitoring device utilizing a unique contactless acoustic sound measurement technology. 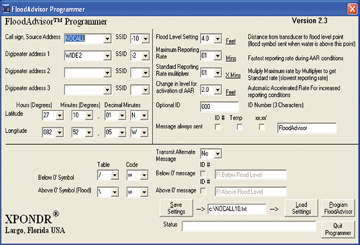 The flood measurement data is sent as a packet burst using a self-contained 2 meter VHF APRS transmiter of 1 1/2 watts. The FloodAdvisor® is user programmed with the ham station call and the lat-lon of the location plus other information. The packet data is made highly reliable in transmission by utilizing protocals of the industry standard AX-25 packet code. Programming FloodAdvisor® is easy through the use of built in software in each unit. All that is needed is the programming cable (supplied) that is attached between the FloodAdvisor® and a PC running XP, 98SE or ME. For ham use the call is entered along with the packet routing, the needed flood reporting conditions and a selection of wording to be presented with the packet data. An additional phrase may be added for the data "status" presentation as displayed on the Internet sites. To view sample sites to track FloodAdvisor® click this link. To view a FloodAdvisor® pdf file, click this link.